The Man in The Red Bandana is the story of Welles Remy Crowther who became a legend when he saved at least a dozen people during the 9/11 attacks. Crowther was killed in the attacks when after leading a group of people to safety he went back in to try and get more people out. Crowher’s heroics were the stuff of legend for almost a year after the attack since no one saw his face and he was seen purely as a myth. Crowther’s story existed in the recollections of those he saved who insisted that a man with a red bandana over his face had saved them . It wasn’t until the stories were connected and people connected events that Crowther’s valor was revealed. The film is made up of reconstructions, recent interviews and archival footage. It is clearly a labor of love by those who were moved by Crowther’s heroics. How you react to The Man In The Red Bandana will depend upon your need to revisit the events of 9/11. 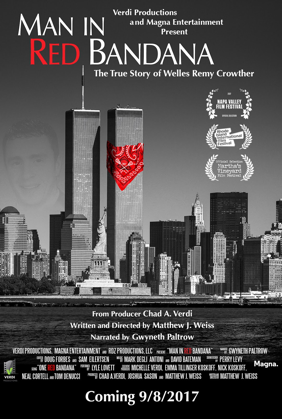 The film is detailed examination of the events of that day as well as a detailed recollections from the people who knew and loved Crowther. If you want to go back into the towers and really experience what happened I recommend the film. Personally I’m mixed in the film. The all over sourced nature of some of the material made me feel like this was more a direct to home video or a You Tube film. That’s not a bad thing, since it brings an intimacy a more polished film would never have however, it makes me wonder what it’s doing on a big screen. The film is also very somber feeling more like memorial or eulogy rather than a celebration. The film depressed me more than anything. (Though I freely admit the final turn absolutely wrecked me). The Man in A Red Bandana is not a bad film by any stretch of the imagination rather it’s a trip into place I don’t know how many of us will want to travel to. If you feel the need to spend 85 minutes in a sad place go see it.